About A Son a documentary about the life of Nirvanna singer Kurt Cobain, will be released on March 30th. The documentary features previously unheard interviews with Cobain, recorded a year before his suicide in April 1994. The recordings by journalist Michael Azerad, contain some rather revealing things about the cult icon. Something that amused me are Cobain’s stories about stealing from his mothers cannabis stash, and replacing what he had taken with herbs. Eventually all that was left was Oregano, and his Mother made him and his friend smoke it! Cobain talks candidly about being branded as gay at school and his relationships with the rest of the band and of course Courtney Love. Courtney Love wants Ryan Gosling to play Kurt Cobain. Courtney Love has said that she wants actor Ryan Gosling to portray her late husband Kurt Cobain in the film Heavier Than Heaven. 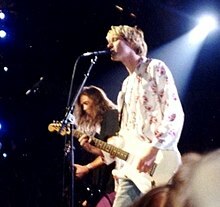 Love is executive producer on the project, based on the Charles Cross biography of Cobain. Despite earlier reports that Kirsten Dunst would play the ex Hole singer, reports suggest that Love has now asked Scarlett Johannson to portray her in the film. She wants the best actors to play them, says a report in the Mirror, adding “It will be explosive”. Author John WilliamsPosted on January 14, 2008 Categories Films, Kurt Cobain, Music BooksLeave a comment on Courtney Love wants Ryan Gosling to play Kurt Cobain.